Flowers are blooming, bees are buzzing, and the sun is extending its stay in the sky longer. Well, that may be true in some parts of the country, others, not so much. But even if you're still shoveling snow, today is officially the first day of spring--and time to start looking forward to warm-weather fun. Flowers are blooming, bees are buzzing, and the sun is extending its stay in the sky longer. Well, that may be true in some parts of the country, others, not so much. 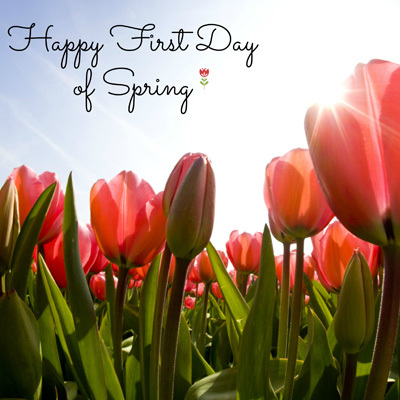 But even if you're still shoveling snow, today is officially the first day of spring--and time to start looking forward to warm-weather fun. Soon it will be time for fans to flock to outdoor baseball stadiums, runners to ditch their treadmill for the track, and foodies to get creative with spring vegetables and fruits, such as cherries, asparagus, and grapefruit. Spring cleaning! Not only is it a good idea to de-clutter and organize your house, but take the time to recharge your mind and evaluate your social and work schedule to make more time for yourself. Swap those warming soups for chilled and refreshing salads. Get creative and swap out plain lettuce or romaine for arugula or mizuna. Also, try experimenting with new vegetables, like this Endive and Snap Peas Salad with Parmesan Dressing. Get active outdoors! Take a run through the park or grab a friend for a tennis match. It's nice to come out of hibernation and get a dose of fresh air and feel reenergized in your workout. Pack a healthy lunch and grab your family and a blanket for a picnic in the park. Not sure what to pack? Finger foods, like bruschetta or salsa are easy to make and pack, and make for convenient snacking.